Campanaro (undisclosed) was released off injured reserve by the Titians on Tuesday, freelance NFL writer Howard Balzer reports. Analysis: Campanaro was placed on IR in late August with the undisclosed injury, and now heads to free agency. The 25-year-old spent the previous four seasons with the Ravens, with his most prominent role as a return man. 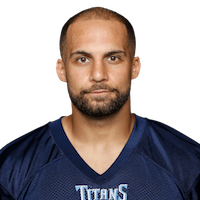 Campanaro (undisclosed) was placed on injured reserve Sunday, Jim Wyatt of the Titans' official site reports. Analysis: Campanaro spent the previous four seasons with the Ravens before signing with the Titans this offseason. He has missed a solid portion of training camp and was slowed by injury throughout his tenure with Baltimore. The Titans are now more likely to keep Nick Williams (hamstring), Darius Jennings and/or Deontay Burnett on the 53-man roster. Campanaro (undisclosed) won't play Saturday versus the Buccaneers, Terry McCormick of TitanInsider.com reports. Analysis: Campanaro has been sidelined for about one week with an unknown injury, continuing a trend from four mostly injury-plagued seasons with the Ravens. While he's in the conversation for a depth wideout spot and work as a returner in Tennessee, he's not doing himself any favors by spending time in the trainers room. Campanaro (undisclosed) missed practice Sunday and Monday, Erik Bacharach of The Tennessean reports. Campanaro passed his physical and was activated off the non-football illness list Tuesday, Jason Wolf of The Tennessean reports. Analysis: Campanaro appeared in a career-best 13 games with the Ravens last season, though his 263 offensive snaps amounted to just 19 catches on 27 targets for 173 yards and a touchdown. He also served as a returner on both punts and kicks last season and will likely compete with Adoree Jackson for those spots on his new team in 2018. Campanaro has been placed on the Non-Football Illness list, Ian Rapoport of NFL Network reports. Analysis: Players are scheduled to report to camp Wednesday and there is a chance Campanaro can be added back to the active roster before practices kick off Thursday. However, the wideout may take some extra time to get completely healthy before things ramp up. Campanaro's one-year contract with the Titans is for $880,000, with $45,000 coming in the form of a signing bonus, Jeff Zrebiec of The Baltimore Sun reports. Analysis: Campanero finds a new home in Nashville after spending the first four seasons of his career with the Ravens. Although he has never played a major offensive role, the former seventh-round pick has established himself in the return game. Last season, he recorded 159 kick return yards, 291 punt return yards and a punt return touchdown through 13 contests. Campanaro will visit with the Titans on Thursday, Jeff Zrebiec of The Baltimore Sun reports. Campanaro appeared in 13 games in 2017, hauling in 19 of 27 targets for 173 yards and a score while adding one punt return for a touchdown. Campanaro is listed as active Sunday against the Lions. Analysis: Campanaro is back in the mix for Baltimore after being a healthy scratch in Week 12. The 24-year-old is likely fourth in line for targets among Baltimore wideouts, as his biggest contributions are in the return game. Campanaro is inactive for Monday night's game against the Texans, Jeff Zrebiec of The Baltimore Sun reports. Analysis: Campanaro wasn't on the Ravens' Week 12 injury report, so this is a bit of a surprise, given his utility as a punt returner. Lardarius Webb figures to replace Campanaro in that role Monday, while the Ravens' wideout corps will be comprised of Jeremy Maclin, Mike Wallace, Chis Moore and Breshad Perriman. Campanaro saw just six offensive snaps in Sunday's win over the Packers. Analysis: Even though Breshad Perriman was inactive, Campanaro still couldn't crack the rotation for the Ravens. He was on the field for six out of a possible 59 plays. Aside from a two-game stretch where Campanaro saw 45 and 49 percent of the snaps, Campanaro hasn't cracked the 30 percent threshold in any of his other games. He figures to remain as a fringe option in the Ravens offense. Campanaro (shoulder) is listed as active for Sunday's game against the Packers. Analysis: Though listed as questionable for the contest by the Ravens, Campanaro practiced fully all week, so it's no surprise that he's available. With fellow wideout Breshad Perriman inactive, Campanaro is a candidate to see added work in the Ravens' three-receiver sets alongside starters Jeremy Maclin and Mike Wallace. Campanaro (shoulder) was a full participant in Wednesday's practice and is in line to play Sunday against the Packers. Analysis: Since Campanaro is positioned as the Ravens' No. 4 wideout, he's only been targeted 17 times in seven games. 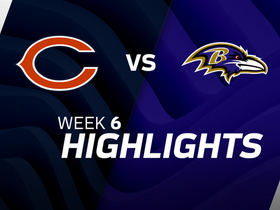 However, he occasionally is used in the run game, and the fourth-year pro returned a punt for a touchdown in Week 6 against the Bears. For the time being, he's not a true fantasy contributor. 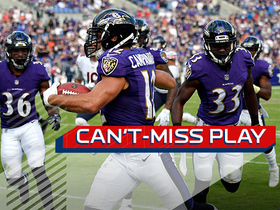 However, considering the top three Ravens receivers have all missed time at some point this season, should that happen again, Campanaro may vault into fantasy relevance in deeper leagues. 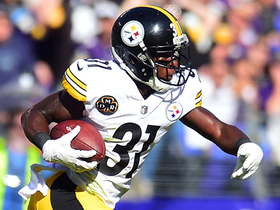 The Ravens released running back Bobby Rainey on Monday, which indicates that Campanaro (shoulder) could be in line to return for Week 11, Jeff Zrebiec of The Baltimore Sun reports. Analysis: Campanaro has been sidelined the previous two games while nursing a shoulder injury. The 26-year-old has notched just 12 receptions for 91-yards to go along with 33-yards on four carries through seven games, so he does not figure to play much of a role on offense should he return. However, he could be in a position to see an increased workload should fellow pass-catcher Jeremy Maclin (shoulder) miss some time. Campanaro (shoulder) was ruled out of Sunday's game against the Titans. Analysis: Campanaro will miss his second consecutive game due to his shoulder injury. 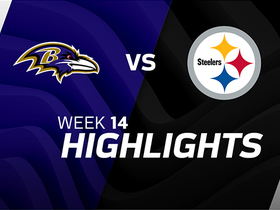 The Ravens will be well-stocked at receiver despite his absence, however, with Mike Wallace, Jeremy Maclin (shoulder) and Breshad Perriman all expected to available. Campanaro (shoulder) isn't practicing Thursday, Jeff Zrebiec of The Baltimore Sun reports. Analysis: Campanaro didn't practice Wednesday either, putting his status for the Week 9 matchup with the Titans in peril. 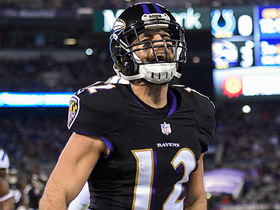 The Ravens are expected to have their top three wideouts -- Mike Wallace, Jeremy Maclin (shoulder) and Breshad Perriman --available for that contest, however, so the likely absence of Campanaro should go mostly unnoticed in the fantasy realm. Baltimore Ravens quarterback Joe Flacco connects with wide receiver Michael Campanaro for a 6-yard TD. 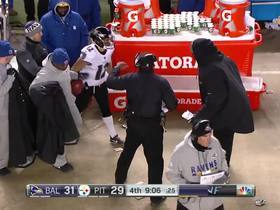 Baltimore Ravens wide receiver Michael Campanaro ties it up with a spectacular 77-yard punt return touchdown. 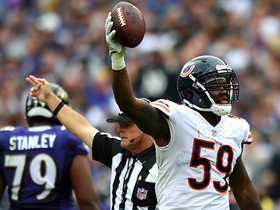 Chicago Bears linebacker Christian Jones forced a fumble, but linebacker Danny Trevathan was quick to recover it. Baltimore Ravens wide receiver Michael Campanaro rushes around the end for 23 yards. Baltimore Ravens wide receiver Michael Campanaro picks up 39 yards on end around. 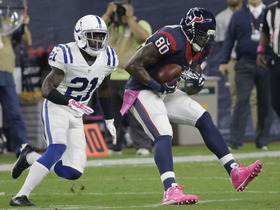 Houston Texans wide receiver Andre Johnson makes a great catch in tight coverage for a touchdown against the Indianapolis Colts, but was it good enough to be the best catch of the week?